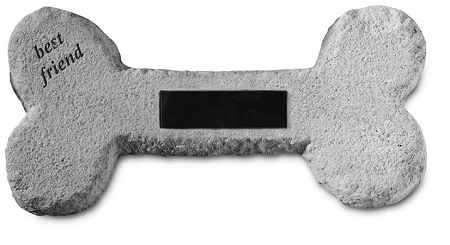 Home > Pets > Pet Memorial Stones > Personalized Dog Memorial Bone - Best Friend.. This dog memorial is shaped as a dog bone and has Best Friend inscribed on it. The memorial stone has a rich texture with the look, feel and weight of true stone. Made of cast stone, it is weatherproof and has year-round durability.